This week’s episode of Raw was ok, not spectacular, but just ok. Whilst we were presented with two legit main events, with Daniel Bryan facing Kane and WWE Champion John Cena facing off against Ryback in a tables match, nothing really happened. Story lines were left fairly stagnant, or segments were repeated from previous weeks. So whilst, the majority of what was presented was entertaining, what was presented wasn’t really new. Raw kicked off this week with WWE Chairman Vince McMahon and Raw General Manager Brad Maddox in the ring. They went over old ground, with Vince admonishing Maddox for allowing John Cena to pick his opponent, and listing the reasons he dislikes Daniel Bryan. Of course, Daniel Bryan came out to reply to Vince. It was interesting to hear that McMahon hates John Cena, and it did kind of remove the element of reality that had been injected into the rivalry before. It’s clear to anyone that McMahon loves Cena, he’s the company’s biggest draw and merchandise seller, why would the chairman not want him as WWE Champion? It could have worked if it had been explained a little better, but I just ended up shaking my head. McMahon also told Bryan that John Cena had lied to him, when he picked him two weeks ago, with Bryan finishing the segment by saying he would become the new WWE Champion at SummerSlam and the crowd strongly agreed. As we built to the first main event, Kane went to visit Brad Maddox in his office. In Kane’s first appearance since he was attacked by The Wyatt Family on the July 8th episode of Raw, he was clearly out for revenge on Bray Wyatt and his brothers. Maddox told him that he should send a message to The Wyatt’s by defeating Daniel Bryan tonight. It was a good move by WWE as it gave Kane a reason to fight against his former tag team partner and helped build the contests up further, with both men having something to prove. Elsewhere, Daniel Bryan searched out John Cena in the locker room to ask if Vince McMahon was right. In another nothing segment, Cena talked about never trusting Vince, before Cena asked if Bryan thought he was a liar. Once again, the possible tension between Bryan and Cena was teased, it will be interesting to see if this capitalised on further during the next three weeks. The match between Kane and Daniel Bryan was as good as I had expected, with the action going back and forth throughout, it was nice to have a change from what you’d regularly see when a big man and little man face off in WWE. It’s amazing to me that Kane is still able to go at the pace he does, especially when in the ring with Daniel Bryan whose pace has been incredible as of late. A lot of the action was stuff we’ve seen before out of Bryan and Kane, but the way it was put together and paced made it still an entertaining watch. The only glaring error for me, was a edit from WWE with Bryan pulling Kane out of the ring, which certainly slowed down the match a little and distanced me a little from the bout. Bryan went on to pick up the victory with an awkward looking small package reversal to Kane’s chokeslam attempt. Whilst, it did look slightly awkward, I think it added to the ending of the match, as a totally clean looking small package would have made the victory look almost too easy. It was important win for Bryan heading into SummerSlam and shows he can beat men much bigger than him, as he will have to do if he wants to capture the WWE Championship. After the match, The Wyatt Family turned up, with Erick Rowan and Luke Harper going after Kane in the ring, Kane made a beeline from the leader, Bray Wyatt. Harper and Rowan quickly double teamed to take down Kane, before Bray Wyatt hit Sister Abigail to finish him off. It was pretty similar to what we’d seen three weeks ago, as well as The Wyatt’s other attacks on R-Truth, 3MB, Justin Gabriel & Tons of Funk. There was then another creepy promo from Wyatt, as he talked about Kane no longer being the Devil’s Favourite Demon. It was probably the best promo we’ve seen from Wyatt on main stream WWE, as his delivered was a lot calmer and he took his time, which isn’t something you see too often in WWE. I’m really interested to see what’s to come between The Wyatt’s and Kane, as it feels like we’ve only seen the tip of the iceberg of this rivalry so far. Daniel Bryan's story continued with Vince McMahon, WWE COO Triple H and Stephanie McMahon discussing his future, with Stephanie coming up with the ridiculous idea that Bryan needed a corporate makeover, I'm not a religious man but please God don't let this happen. 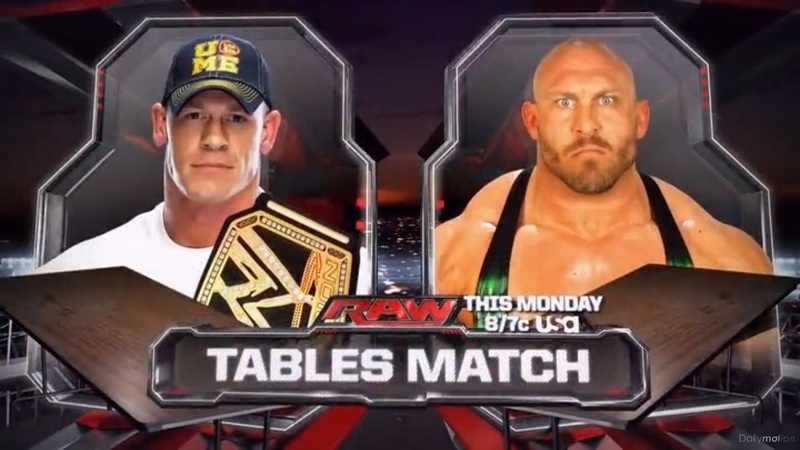 I wasn’t exactly riveted when this match was announced at the end of last weeks Raw, we’d already gone through a fairly boring Ryback and Cena feud a few months ago, and that feud had already included a Tables Match, as part of the Three Stages of Hell Match at Payback, which wasn’t particularly something I wanted to see again. Plus, after seeing Ryback put Cena’s SummerSlam challenger Daniel Bryan through a table last week on Raw, it did feel a little bit like WWE pulling a TNA and ending up with the focus on the wrong characters. Building up to the match, we saw Ryback get into a confrontation with a member of staff backstage, with Ryback pushing the person around, before picking them up and slamming them through a nearby table. WWE are seemingly pushing Ryback into a cowardly bully role now, Ryback is actually looking fairly comfortable in the role, the only problem is Bully Ray does it better. I was actually pleasantly surprised with the Tables Match, it was very watchable television main event. With some inventive spots, including tables bringing the ring and the steel steps, it kept me involved in the match from the offset. However, there were a number of problems with the match, that stopped it from being any better. Firstly, John Cena’s STF looks weak as hell, leaning into an opponent whilst in an STF makes it look like you’re giving them a hug, he should really be pulling back to make it look painful. Cena also has a tendency to pre-empt moves, such as when Ryback swung him into the steel steps, and Cena clearly stopped before throwing himself into the steps. I’m not the biggest John Cena critic and will praise when he deserves it but moments like this are things you can get away with at a small house show, you can’t when you have a load of cameras aimed at you. The finish saw Ryback dominating Cena hitting a few power moves, before a Meat Hook Clothesline. As Ryback set up Cena up for another, this time with Cena positioned in front of tables, Cena reversed sending Ryback through the table with an Attitude Adjustment. 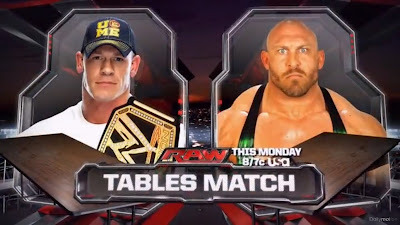 As endings of Tables Matches go this was fairly good, and whilst we all knew Cena would be picking up the victory in made Ryback look just strong enough to not bury him too much. I am surprised they had Ryback in this match at all, as he really could have done with sometime away from the main event scene to rebuild, and another loss in a big match certainly won’t help him with that. To close the show, Daniel Bryan came out and teased he would hand Cena the WWE Championship, instead pulling it away from Cena, much to the delight of the crowd. Cena eventually snatched the championship back, in a move we don’t see a lot out of Cena. It’s interesting to see Cena displaying signs of jealously towards the popularity of Daniel Bryan, as it’s helping to bring a bit of dimension to the character and the storyline that was missing in his feuds with Mark Henry and Ryback. In another main event quality match up, World Heavyweight Champion Alberto Del Rio faced off against Christian. With Alberto Del Rio picking his SummerSlam opponent on this week’s Smackdown, I was extremely intrigued by this match. Christian, along with Rob Van Dam, was one of my top picks to get the nod to face Del Rio at SummerSlam, after WWE took Dolph Ziggler in a different direction. So the way this match played out would really show if WWE considered Christian to be a top contender to the title, if he lost clean it was pretty much over for Captain Charisma and back to the mid card. Christian and Del Rio have faced off a number of times before, mainly during Edge’s rivalry with Del Rio building to Wrestlemania 27, with Christian actually winning his first World Heavyweight Championship in a Ladder Match with Del Rio soon after. However since then, the two have been keep on the same side of the fence for a long time, after Christian’s heel turn, and then both turning face again. Therefore, this felt like a fairly fresh match up which WWE doesn’t exactly have too many of any more. The majority of the bout saw Del Rio work over Christian, specifically his arm for the Cross Arm Breaker submission hold, with Christian doing a great job of selling the arm, and building for a comeback. After an exciting closing section with a number of reversals, Christian rolled out of the Cross Arm Breaker to pick up a pinfall victory over the World Heavyweight Champion, with a small package. The match built to this moment really well, as it was clear that Del Rio was building up for the Cross Arm Breaker, and that if he locked the move in that it would be the end of the match, due to Christian’s top notch selling, so when Christian quickly evaded the submission hold it was a satisfying ending to the bout. Yes, we got two roll up victories in major matches on the same show, but both made sense to the story that needed to be told, so I’ll forgive here. Now, the smart money would say that Del Rio won’t be choosing Christian to face him at SummerSlam. Why would you put your title on the line against someone who has just beaten you? Especially when you’re as slimy as Alberto Del Rio. However, I can’t imagine it’s going to be that simple on Smackdown. Vickie Guerrero never really said that Del Rio would have the chance to choose his opponent, just that he had a week to think, so I can see a swerve happening there. I would be very surprised if come the end of Smackdown, either Christian or Rob Van Dam isn’t proclaimed Number One Contender to the World Heavyweight Championship. In a rematch from both Payback and Money in the Bank, Divas Champion AJ Lee faced Kaitlyn, this time with no title on the line. In terms, of Divas Matches this wasn’t too bad, but couldn’t live up to their original Payback contest, at times looking a little bit sloppy and lacking the psychology that made the original one of the best women’s matches on television this year. In a surprise victory, Kaitlyn picked up the pinfall following a spear, as WWE continues to play on the down fall of AJ Lee. Surely, this gets Kaitlyn another Divas Championship Match soon, I know we’ve seen it before, but I’d much prefer this than one of the Bella’s ending up with the title on the back of Total Divas. After this as Big E tried to comfort AJ, Dolph Ziggler turned up on the entrance ramp and challenged Big E to an impromptu match. Now, I was surprised at this as I had genuinely expected to see this match on the SummerSlam card. The bout was decent with Langston throwing Ziggler around the ring, as The Show Off sold his arse off. However, it was cut short after AJ had seen enough and attacked Dolph giving him a disqualification victory. Langston obviously wasn’t happy at losing and some tension between he AJ was teased. I’m not quite sure where they are going now with this heading into SummerSlam. They could have Big E vs. Dolph again, but I can only see a similar finish taking place, as the real feud is between Dolph and AJ. Maybe a mixed tag with Kaitlyn involved as well, but I’m not sure how they’re going to tie up this story at the moment. Elsewhere, Intercontinental Champion Curtis Axel was in action against R-Truth. With Paul Heyman doing a good job of pre-match promo, talking about both Brock Lesnar and CM Punk, before moving onto his youngest star Curtis Axel. Even Axel did a good job with his promo, even if he continues to leach of his father’s legacy to get heat. Axel quickly dispatched of R-Truth in what was essentially an enhancement match, with Truth getting in very little offence between Axel hit the Axe Driver for a pinfall victory. WWE clearly has no plans for R-Truth at the moment, and he must be another name on the list for the next lot of WWE releases. After the bout, CM Punk made his presence felt, as he tried to attack Paul Heyman. With Axel protecting his manager, allowing Heyman to escape through the crowd, Punk turned his attention to him throwing him into the barricade amongst other things. This was a good way to keep the story moving along heading into SummerSlam without Brock Lesnar being present, essentially keeping it warm. I’d like to see Punk vs. Axel next week on Raw, with Brock Lesnar making a return to continue the rivalry, especially with WWE not seemingly having plans for an Intercontinental Championship Match at SummerSlam. Cody Rhodes was also in action this week in a good short match with Wade Barrett. There was a lot of back and forth, and WWE talent would do well to look at this match as how to put together an interesting contests that only lasts three minutes. The ending was beautifully worked with Cody Rhodes slipping seamlessly out of a Barrett Pumphandle slam to hit Cross Rhodes for the pinfall victory. After the match, Damien Sandow came out to cut a scathing promo on Cody, which is probably the best I’ve seen out of Sandow, it was nice to see him cut a 100% serious promo to really sell this rivalry. With Sandow cutting into Rhodes’ family for being clowns, I wonder if we’ll see any appearances from Goldust and Dusty Rhodes on Raw anytime soon. In another match that had been rumoured to take place at SummerSlam Mark Henry teamed with The Usos to take on The Shield. It was another entertaining six man involving the Shield, and while it wasn’t quite as epic as their battles with the likes of Team Hell No, The Undertaker and Randy Orton, it told a good story and the in ring action was solid throughout. The Shield picked up the victory, after Mark Henry had been taken out by a Roman Reigns spear, Dean Ambrose hit the Headlock Driver on one of the Usos for the pinfall. It looks like the Usos push as opponents for the Shield could be coming to an end after this match, as they both took quite a beating for Ambrose, Rollins and Reigns. Whilst Mark Henry was made to look strong throughout, dominating the action until the spear from Reigns. It’s another case of me not quite knowing where this is heading, which is good as long as WWE knows where they’re going. I wouldn’t be surprised to see Big Show make his return to form a team with Henry soon, maybe even a two-on-three handicap match at SummerSlam. Elsewhere, my other favourite to face Alberto Del Rio at SummerSlam, Rob Van Dam, was in action against Fandango, who had Summer Rae at ringside. After an awkward start, the match started to pick up with some nice shows of athleticism from Van Dam and Fandango, both bringing some nice kicking combinations. Just as Van Dam launched into the familiar routine we’ve seen in recent matches with the likes of Darren Young and Wade Barrett, including the Rolling Thunder and springboard thrust kick, WWE threw us a curve ball. With Van Dam in position for the Five Star Frog Splash, Fandango exited the ring and left up the entrance ramp, giving Van Dam the countout victory. It was interesting to see WWE not having Fandango lose cleanly to Van Dam, somehow protecting him, they obviously have big plans for him coming up. In the second women’s bout of the night, two of the stars of Total Divas were in action as Brie Bella faced off against Natalya. This match was pretty poor, with the idea behind it being that The Bellas had called Natalya the “ugly duckling” of Total Divas, which isn’t something WWE should really be saying about any of their talent, especially when they want us to take their Be A Star campaign seriously. The two basically trod water until Nikki Bella came out with Kazoo, yes a Kazoo, to cause the distraction and allow Brie to pick up the victory. It’s frustrating to see WWE use one of their top in-ring female talents in Natalya in such a way, when the Bella’s are still to show any real talent for the wrestling business, beyond sharing certain biological traits with another person. 1. Daniel Bryan and John Cena do not need any outside interference to help build to their match at SummerSlam. 2. But it is nice to see a heel Vince McMahon again. 3. The Raw announce team needs JBL to keep things entertaining. Left to their own devices Michael Cole and Jerry Lawler just spout the same rubbish they have for the last four years. Do You think "Big Shows" Injury is A WWE Plan?